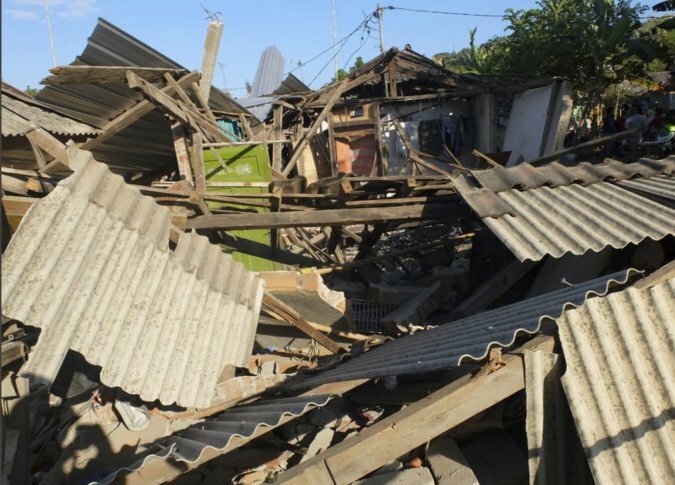 National Disaster Mitigation Agency spokesman Sutopo Purwo Nugroho said the death toll had risen with hundreds others injured and thousands of homes damaged. MATARAM, Indonesia (AP) — A powerful earthquake struck the Indonesian tourist island of Lombok, killing at least 91 people and shaking neighboring Bali, as authorities said Monday that rescuers still hadn’t reached some hard-hit areas and the death toll could climb. National Disaster Mitigation Agency spokesman Sutopo Purwo Nugroho told a news conference that damage was “massive” in the north of Lombok. Some areas still hadn’t been reached, with rescuers hampered by collapsed bridges, electricity blackouts and damaged roads blocked with debris. Sutopo said the death toll had risen to 91 and more than 200 people were seriously injured. Thousands of homes and buildings were damaged and 20,000 people are in temporary shelters. The quake, measured at a magnitude of 7.0 by Indonesian authorities and a still-powerful 6.9 by the U.S. Geological Survey, struck early Sunday evening at a depth of 10.5 kilometers (6 miles) in the northern part of Lombok. Video showed screaming people running in panic from houses in a Bali neighborhood and vehicles rocking. On Lombok, soldiers and other rescuers carried injured people on stretchers and carpets to evacuation centers. Many victims were treated outdoors because hospitals were damaged. “People panicked and scattered on the streets, and buildings and houses that had been damaged by the previous earthquake had become more damaged and collapsed,” Sutopo said. Sutopo said there were no fatalities among the local and foreign tourists and a joint search and rescue team had deployed three ships to evacuate people. Australia’s home affairs minister tweeted that he and his delegation were safely evacuated in darkness from a Lombok hotel where they have been staying during a regional security conference. Home Affairs Minister Peter Dutton told Fairfax Media that he was on the hotel’s 12th floor when the quake struck. He said the quake “was powerful enough to put us on the floor” and cut power. The Bali and Lombok airports continued operating Sunday night, according to the director general of civil aviation. There had been a half-hour evacuation at the Lombok airport following the quake because the electricity went off. TV showed crying women consoling each other outside Lombok’s airport. Karmini reported from Jakarta, Indonesia. Associated Press writer Stephen Wright in Jakarta contributed.